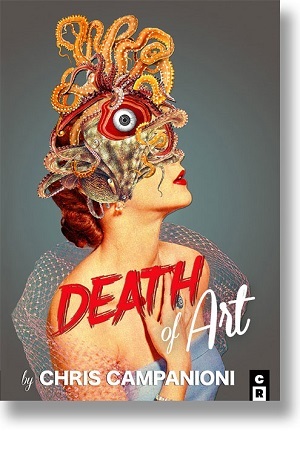 Writer Chris Campanioni gives a crucial glimpse into our modern narcissism with his new book of memoir / non-fiction / hybrid text / does it really matter, Death of Art. Despite the ostentatious title, Campanioni tactfully avoids repeating oft-argued cliches regarding art’s apparent demise, and instead uses the title as an entry point for talking about identity, language, social media, and modern life as a kind of performance. I had lately been thinking of a project titled Death of Art, which itself came from the blacked out title of a poem I’d just written called ‘Death of the Artist…’ Cutting out my face could be the beautiful overture. Formally, Death of Art moves from vignette style passages of memoir, to essays and poetry. Campanioni’s tone alternates from playful, to philosophical, to the banal and the confessional, and all at a blistering pace. His subjects range from 90210 and Tinder dates, to social media narcissism and celebrity culture. An obsession with 90210 and a brief reference to Care Bears in particular become interesting pivot points for Campanioni to make comparisons between the empathy of our former analog world, and the disconnectedness of our modern digital world. Death of Art brilliantly taps into our insatiable need to be seen and felt via social media, and how life is not experienced in our modern age, but rather, documented. The Facebook photo as preferred cultural currency to the actual image and experience represented. The same way that our generation will look back on our lives in sixty years and there will be plenty to see. Probably we only wish we would have lived it too. In the section titled “Self-Interested Glimpses,” Campanioni adopts an essay style (as he frequently does) and argues that “Authentic experience has been replaced by fetishized experience; existence becomes object.” In Campanioni’s world, the Instagram photo of a sunset now reigns supreme over the actual sunset. This is not a wildly new concept, as many postmodern thinkers have believed that society and modern culture have started to place more importance on “simulacra” or the simulation of reality, rather than the object itself. For Campanioni public spaces have become zones of anti-social behavior. He argues that the increased access to each other that social media provides us has “led us to become less tolerant, less sympathetic, and less understanding.” This is exemplified in the book via the nearly tweet sized entries describing a series of Tinder dates where he struggles to make eye-contact and prefers to meet in coffee shops, hotel bars, or “anywhere public enough to pass through, in transit, like anyone else. Just passing through.” The Tinder passage in particular reads like a detritus of ineffectual millennial dating experiences that only work to solidify Campanioni’s belief that our ability to connect is stunted, not enhanced, by applications like Tinder. We lived our days as if they were scenes in a musical; we danced & continued to sing. Sometimes in Spanish or English but also often in a language made up by my father, a practice I’d adopt too, & which became my true joy in life: the pleasure of words & the sounds they contained. Whether it meant anything was besides the point; it meant everything. Death of Art is a punchy hybrid text that holds its own intellectual weight and does well to not veer off into pretension nor cliche, which is no minor triumph considering it’s broad and aspirational title. Campanioni is a serious writer and a world class thinker, and there is something great to be gleaned from his latest offering that seems to revel in its ability to avoid classification and open up a dialectic about the modern ways in which we communicate. Death of Art is available now through C&R Press.